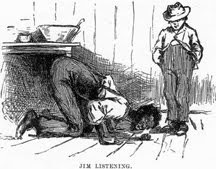 In the closing chapters of Huckleberry Finn, Huck's best friend, Tom Sawyer, shows up and offers a way to help Jim get to freedom. As the story ends, however, Huck faces an interesting choice. Along the route down the river, he has learned about people he shouldn't trust--people like The Duke and The King--and about those that he can, people like Jim. This leads to my question: who is Huck's best friend as the book comes to an end. Is it Jim? Is it Tom? Or is it no one? Support your answer with examples or quotes from the book. Keep your answers to 100-200 words. The character development in Huck has presented Huck with the interesting choice of where to place his loyalty. Huck has transformed from a grungy rapscallion into a wise trustworthy young man, his previous best friend was Tom Sawyer but now is Jim's loyal companion. At the end of the book Huck chooses to leave the rogue life with Tom and take the more regal path with Jim. Huck's best friend at the end of the story would definetely have to be Jim just because they had done everything together. They have also helped each other through every hard time that they encountered. Nobody else could be his true best friend because everyone else lied to him and was just a fake friend. Jim was just always honest to Huck and never lied to him so that's why I think jim was the true best friend of Huck's. Huck's true best friend is Jim. Huck cared about Jim a lot, it was against the law to not turn Jim in and he didn't. He stuck by Jim's side no matter what. Jim was glad to have Huck in his life, helping each other reach freedom. When Jim got turned in by the Duke and the King, Huck was determined to help him get released. Huck was going to break laws just to help Jim. They have been through so much together such as: living in a cave and meeting the duke and king then being conned by them. Whether Huck realizes it or not, he needs Jim as much as Jim needs Huck. I think by the end of the book there is no doubt that Huck is better friends with Jim. Mainly i think this cause Tom didnt come into the book till the end end and him and huck havent really seen each other in awhile. I think Jim was his Best friend cause they had been through more adventures and had each others back when they had no one else. Thats why i think Jim is the better friend. Despite Huck's closeness with Jim, Huck still misses his friendship with Tom. In the quote: "Stick a candle in your pocket; I can't rest, Jim, till we give her a rummaging. Do you reckon Tom Sawyer would ever go by this thing?" Even though he does miss Tom. Huck is most content to be in the wilderness with Jim. We get the impression that Huck has everything that he truly needs to be happy: friendship and nature. I think Huck's true friend would be Jim, because Jim would do anything for him no matter what!